First, the Catechism instructs us in choosing sacred, or liturgical art, that such art is appropriate if it principally represents Christ (CCC 1159), expresses the same Gospel message as Scripture (CCC 1160), glorifies Christ through the representation of individual saints who have, in Him, revealed man as an image or likeness of God (CCC 1161), and moves us to contemplation in harmony with the Word of God and hymns of the Liturgy (CCC 1162). 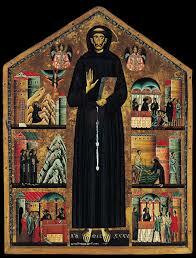 This image of St. Francis answers to its high calling at every point. 1) “Images of beauty, in which the mystery of the invisible God becomes visible, are an essential part of Christian worship.” 2) Images of salvation history, from the Bible and from the history of the saints “have pride of place in sacred art.” 3)Sacred images must point to “the inner unity of God’s action” and “to the sacraments,” and emphasize the Paschal Mystery, inasmuch as Christ is represented, in three aspects: Christ Crucified, Risen, and as “the One who will come again and who her and now hiddenly reigns over all.” 4) Sacred art must be the fruit of contemplation and prayer “undertaken in communion with the seeing faith of the Church.” and 5) Sacred art must not (indeed, cannot) come “from an isolated subjectivity,” but emerges from the submission, by the artist, of his skill and freedom to “the logos of things” – reality as understood through the norms and doctrines of the Church, as opposed to that which is merely apprehensible to the senses. The inward formation of the artist by the Church, and his openness “to the ‘we’” of the Body of Christ protects his work from “imprisoning man” in art that does not do justice to the fullness of Truth. The St. Francis altarpiece, again, gets high marks for liturgical use according to Cardinal Ratzinger’s criteria. Offering, as it does, beautiful images from the life of a saint, and as far as a viewer can tell, painted by an artist who is prayerfully formed by and submissive to received Catholic doctrine, this painting succeeds on the (perhaps most important) level of pointing to the Paschal Mystery. Though it is not an icon of Christ himself, the painting evokes the Passion through the stigmata of St. Francis, the Risen Christ through the Saint’s ministry to the poor, and the glorified Christ in the two images of Creation fulfilled in Christ’s perfect dominion: the birds’ docility toward, and the flight of demons at the Word of God. The Holy Bible in St. Francis’ hands (the ‘logos of things’ per Cardinal Ratzinger) speaks of his and of the artist’s sense of the primacy of the Word of God, as revealed in Scripture. The full deposit of Faith – the unity of these Scriptures with the Tradition of the Church of Christ – is made explicit by the juxtaposition of the Bible with the wound-marked hand of St. Francis. If we ask the question, as suggested, “…into or towards what, in the painting, is the host being elevated?” we find the further element of liturgical action has been accommodated by Berlinghieri in this painting. It’s as though, at the elevation of the Blessed Sacrament, this entire piece would come to life. In the person of Christ, we believers are raised up through the chastity, poverty, and obedience of discipleship toward the sanctity of sainthood, and toward participation in the redemptive suffering of Christ. In the unity of received doctrine – the revelation of the Word of God – we are formed into His very Body for the sake of the coming of the Kingdom into this world – through our receptivity to Him, our proclamation of His message, and our works. Clearly, this artist aims to raise our sites toward an eternal destiny that is not limited to what we can apprehend through our natural senses. He accomplishes well the task of creating art that truly serves the Liturgy, and by extension operates to draw all men toward Christ.